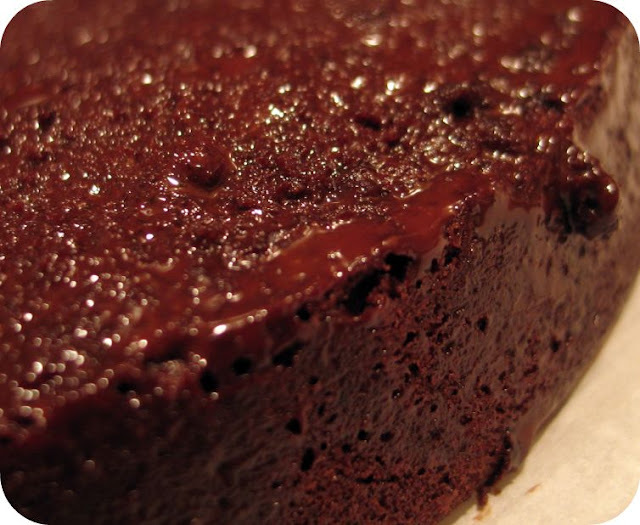 If you're looking for a rich, sinful chocolate cake, this isn't the cake for you. No, this cake is on the other end of the chocolate cake spectrum. It's light, delicate crumb is perfectly paired with the fluffy, not-too-sweet minty whipped cream. And its flavor? All I can say is that it wasn't a chocolate cake with some mint or a mint cake with some chocolate; it was the perfect balance of both. 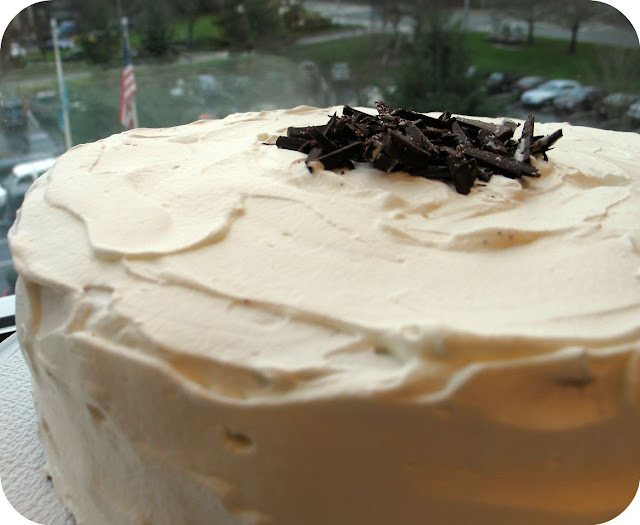 The light, ethereal quality of this cake comes from the fluffy, air bubble-filled batter. This is achieved by spending some time at the beginning of the recipe to cream the butter and sugar together. We're not talking about thirty seconds here, no, not even a full two minutes of mixing. No, my friends, we're taking a full six minutes of creaming here. And then after that, you take time to blend in the eggs, one at a time, taking a full two minutes for each one. By the time you're done mixing the butter, sugar, and three eggs together, the batter it will have almost tripled in volume. And if the cake itself isn't enough, its creamy, minty ganache center is like a Foodie's version of a peppermint patty. This just might be the best chocolate mint cake, ever. Cake: Preheat oven to 350F. 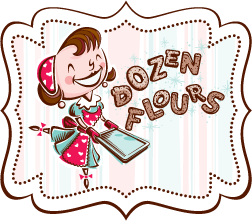 Butter and flour two 10-inch cake pans with high sides (1 1/2-inch-high sides or higher). Line bottom of pans with parchment paper. Sift first 5 ingredients into medium bowl. 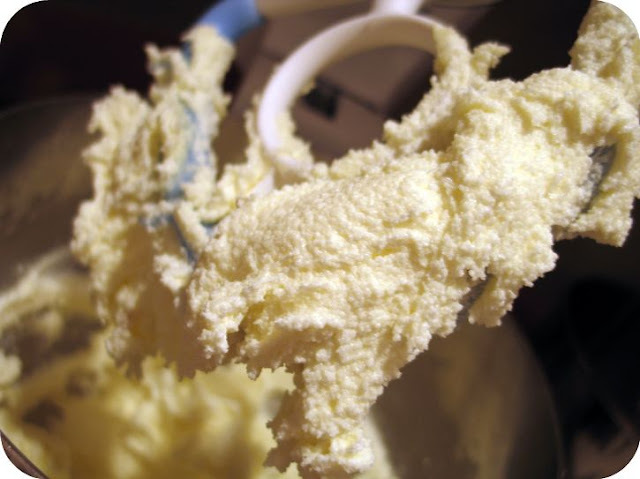 Using electric mixer, beat sugar and butter in large bowl until very pale yellow and fluffy, about 6 minutes (see photo below). Be sure to stop and scrap the bowl at least once every two minutes. Add eggs 1 at a time, beating 2 minutes after each addition (yes, I know it's a lot but trust me). Mix in vanilla and the peppermint extracts. Add dry ingredients alternately with buttermilk in 3 additions each, beating until well blended. Divide batter equally among prepared pans; smooth top of batter. Bake cakes until tester inserted into center comes out with some moist crumbs still attached, about 25 minutes. Cool cakes in pans on racks 15 minutes. Turn cakes out onto racks; peel off paper. Let the cakes cool for about 10 minutes. Transfer each cakes on a plate. 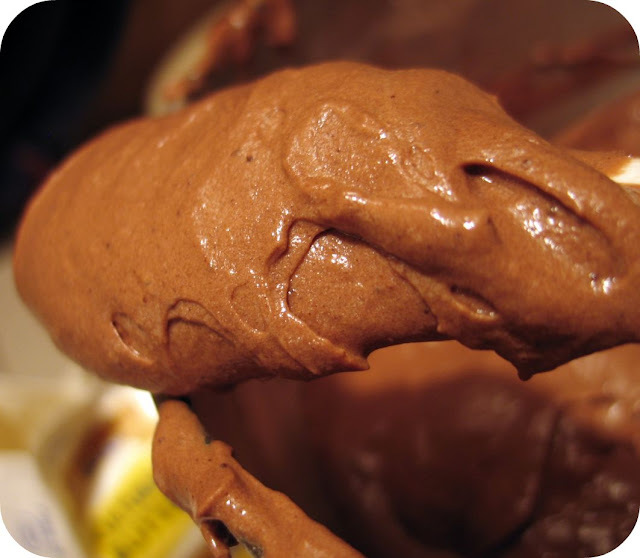 Ganache Filling: Heat the whipping cream in the microwave in a glass measuring cup or heat proof bowl just until it comes to a boil (this should take 1-2 minutes depending on your microwave). You can also head the cream on the stove top if you should choose. Remove the cream from the microwave and add the chopped chocolate. Let it sit for about a minute and then slowly stir the melted chocolate and cream together until they are well combined. Using a big spoon or rubber spatula, spread half the chocolate on the top of each cake, being sure to saturate each cake. Put the cakes in the refrigerator for at least 1/2 hour or overnight until the ganache is good and firm. Put your whisk attachment and metal mixing bowl in the fridge now too (this will make your whipped cream come out better). Whipped Cream: To make the whipped cream, beat cream on the highest setting until it has soft peaks (if you're using a stand mixer, this will only take a minute or two, but if you're using a hand mixer, it could take 5 minutes or longer). Add powdered sugar, cream of tarter, and extract until stiff peaks form. Spread 1 1/4 cups whipped cream on top of the cake. Top with second cake, making sure the chocolate ganache side is face down against the whipped cream (you're essentially forming a ganache/whipped cream sandwich). Spread remaining whipped cream over top and sides of cake. Refrigerate at least 1 hour and up to 6 hours. To make the garnish, use a sharp knife and slice very thin, long strips of chocolate. Pile it in the center of the cake just before you're ready to serve. Your cake looks wonderful. I agree with Bridget, chocolate and mint, yum! It's odd, I don't like chocolate on it's own but pair it with mint or peanut butter and I'm all over it. (I do like dark though) I really need to give this a try. I have a co worker that loves mint & chocolate. Thank you for sharing the recipe! Btw, guess what Babygirl had me make for her class as a Thanksgiving treat? Yup, you guessed. The kids don't ask for anything except it. I have to tell them no so that I can make something else. I've even tried to get them to let me make the pumpkin version but they want whine so much I cave. Like a good soft mattress, I need to roll all over this! This looks incredible! You rock! Oh my goodness, this sounds wonderful! Mint and Chocolate are definitely better together. I can't figure out how to put the link in....forgive me! At one point in my life I was addicted to mint chocolates:) This cake brought back memories:) Looks so good! Me again! I tagged you, too! Come on over to see, but I understand if you don't "play". I just wanted to let everyone know your page rocks! 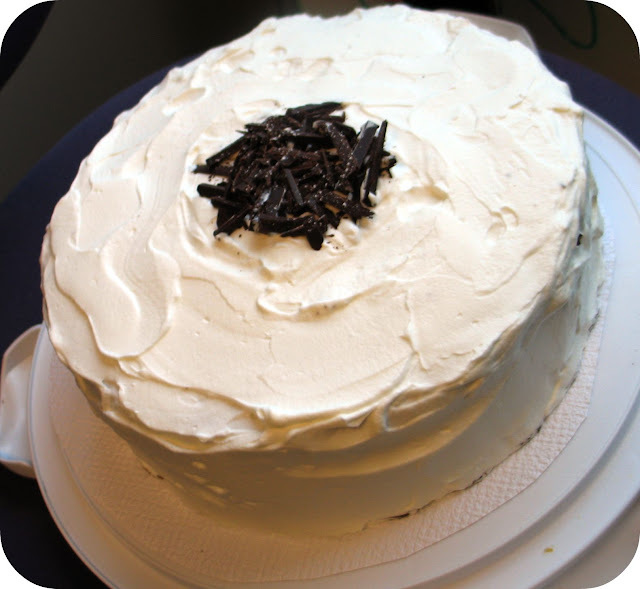 your photos are absolutely fabulous-i am dying for a slice of this cake. YUM! Wow, this is definitely THE perfect after-dinner mint. Oh wow. I definitely have to try this out! Hi! This looks absolutely delicious! I had a question though: if I was making it for someone who loved chocolate and mint, and yet really liked the intense, rich kind of chocolate cake, could I swap out a different recipe for the cake part? Or would you say that the "light, ethereal" quality of the cake really is essential and it just wouldn't be as good with a rich, dense cake? Hi Marie -- I'd say that this isn't the cake for your friend. It's just my opinion but one of the things that we great about this cake was its subtleness which appealed to me personally because it seemed to match the texture too. Everything was light and airy. Perhaps this isn't the best recipe to try?